The College or Architecture's newly refurbished grand piano being set up outside the Dean's Office. A reception and concert featuring pianist Faye Hays and the College of Architecture’s newly refurbished Jesse French Grand Piano is set for 6 p.m. Thursday, Feb. 23 in the Langford A Atrium. The piano was graciously donated to the college by Bob and Marge Reid, parents of 2001 BED graduate Russ Reid. The concert this evening will be held in their honor. All faculty, staff and students are invited to stop by and enjoy the refreshments and music. 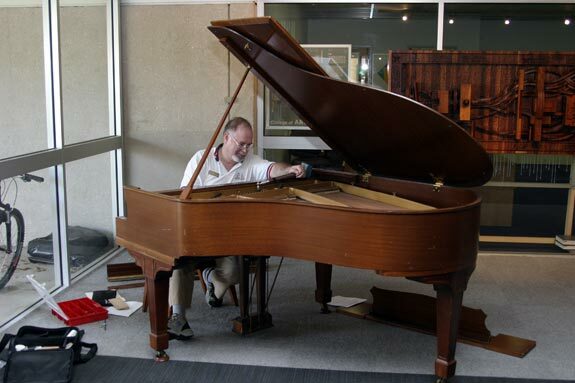 The refurbishing of the piano was made possible by donations from College of Architecture faculty, staff, and students. 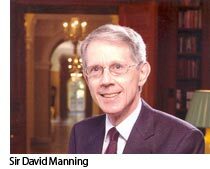 His Excellency Sir David Manning, Ambassador of the United Kingdom of Great Britain and Northern Ireland, will speak at the George Bush Presidential Library Center at 5:30 pm on Friday, Feb. 24. Prior to his talk, he has offered to speak informally with College of Architecture students working on the design of the Hatfield Health Centre in Hatfield, England, a collaboration between Texas A&M University, HKS/Dallas, Ryder HKS International London and Newcastle, England. All interested faculty, staff and students are encouraged to arrive early on Friday, February 24 at the George Bush Presidential Library for the private 4:30 p.m. talk. An upcoming episode of the History Channel’s “Battlefield Detectives” program features research on the D-Day battlefield at Pointe du Hoc, France, conducted by a team from Texas A&M University’s Center for Heritage Conservation. The feature airs 3 p.m. Saturday, March 4. 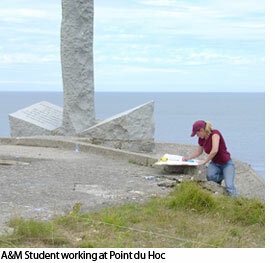 Last summer, a crew from “Battlefield Detectives” filmed the Texas A&M team in the field at Pointe du Hoc. According to Richard Burt, a construction science professor and member of the Center for Heritage Conservation team, the “Battlefield Detectives” episode includes interviews with him and with fellow Texas A&M faculty, including Robert Warden, an architecture professor, and Bruce Dickson from the Department of Anthropology, as well as video of Texas A&M College of Architecture students working at the site. The College of Architecture Riverside Campus Teaching and Research Facility (AKA the Architecture Ranch) is scheduled for completion in April 2006. The availability of a research facility of this size for exclusive use of faculty and students from the College is unprecedented. A meeting has been called Tuesday, 28 February at 11:00AM in Building A First Floor Gallery to determine which members of the faculty are interested in using this new facility. All interested faculty and staff members who want to participate in the ranch endeavor are invited to attend. The meeting will give everyone the opportunity to see the design of the building as constructed, to discuss how we might make the most of this opportunity, and to propose specific uses for their own research agenda. The meeting will last about an hour. This video workshop, free to TAMU System employees, will provide an overview of http://Grants.gov (the single access point for federal grantees), address the current status of the Web site's “find” and “apply” functionality, and address plans for future initiatives. Computer Support’s photo-quality printers received some much needed maintenance this past week and are printing as good as new. Whereas before getting support from Epson on printing problems was next to impossible, we now have an established relationship with a third-party printer repair company in Houston that will keep these printers running in peak condition. Two 44” wide Epson 9600 printers and one 17” wide Epson 4000 printer are available for faculty and student use. Questions regarding these printers should be directed to the College of Architecture Helpdesk, via the web at http://archhelp.tamu.edu, email help@archhelp.tamu.edu, or phone 862-8584. Texas A&M employees who claimed "exempt" from federal income tax withholding in 2005 are required by IRS law to renew the exemption in 2006 by submitting a new W4 form. Letters were sent out in early January informing all affected employees of the Feb. 16 deadline for this renewal. Those who did not renew their exemption will automatically have their W-4 withholding election reset to "single and zero;" withholding will be at this higher rate for all pay after Feb. 21. TAMU employees can update or edit their own W4 information online via HRConnect by logging onto HRConnect at https://sso.tamu.edu and clicking on the Payroll Data Tab. For any questions regarding updating your W4, contact Texas A&M University Payroll Services at <payroll@tamu.edu> or 845-2711. In accordance with college policy, a meeting will be held with Dean of Faculties Karan Watson to discuss the P&T Process with all interested faculty and college administrators. This meeting will be held on March 1 from 3:00-4:30 PM in Building C, Room 207. Dean Regan will also be present. If you will be involved in the tenure or promotion process this year, or if you are interested in learning more about the process, please try to attend. Proposals are now being requested for the Program to Enhance Scholarly and Creative Activities. The Office of the Vice President for Research has established this competitive program to promote the creative and scholarly activities of Texas A&M University faculty. Awards will support scholarly and creative activities primarily in the humanities, arts, and other disciplines in which external funding are typically not available. A variety of activities are eligible for support, including travel to collections and libraries to evaluate original documents. All Texas A&M tenured or tenure-track faculty are eligible to receive this award. The first person listed on the application will be the main investigator, and he or she must be a full-time Texas A&M tenured or tenure-track faculty member. The maximum award amount is $10,000. Proposals are due no later than 5 p.m. March 6, 2006; award recipients will be notified on March 31, 2006. For full guidelines and submission details, see http://vpr.tamu.edu/osp/sca.html. For more information, contact Dr. Rickie D. Fletcher at (979) 845-1812 or by e-mail at osppc@tamu.edu. Due to high demand from the College’s faculty and staff, Computer Support distributed the latest version of Endnote to all faculty and staff workstations this past week. Endnote, a bibliography management tool, can be accessed via the start menu on all Windows computers under All Programs -> Endnote. Why is my Outlook signature double spaced? 1. Edit your signature (Tools | Options | Mail Format | Signatures | Edit). 2. Go to the end of the first line of your signature and press the Delete key until the next line jumps to the end of the first line. 3. Press Shift+Enter (hold down the Shift key while you press Enter). The first and next line should now appear on two lines, as before. 4. Repeat steps 2 and 3 for each remaining line. The newly re-opened Woodshop hours are Monday through Friday, 8:00 a.m. – 12:00 p.m. and 1:00 p.m. - 5:00 p.m. Please remember that the shop is also closed on the weekends. Due to safety regulations, a full-time supervisor must be present in order for the shop to be open. If you have needs to be in the shop during the lunch hour, please see Danny Bass so that he may arrange his schedule to accommodate your needs. The Architectural Research Centers Consortium has announced its call for nominations for the seventh annual ARCC/King Student Medal for Excellence in Architecture + Environmental Design Research. Named in honor of the late Jonathan King, co-founder and first president of the Architectural Research Centers Consortium (ARCC), and former director of the CRS Center at the College of Architecture, this award will be given to one student per ARCC member school. A call for nominations will be forthcoming from CRIC. Mashalle Mooring, Dean’s Office; Susie Billings, CRS Center; Faith Stringer, Business Office; Trisha Gottschalk, CHUD; Chuck Tedrick, Facilities. The purpose of the College Staff Development Council (CSDC) is to create an operating plan for the professional development of members of the staff of the College, and to recommend improvements in the operations and procedures of any and all units in the College regarding staff members. Congratulations and we know you will serve your fellow staff well. Ever wonder what happens in CRIC or ExCom? No need to wonder any longer. A new folder on the college’s S:/ drive entitled Committee Meeting Minutes has been launched. Within this folder you will find minutes from September 1 to current for the following committees: Academic Coordination Committee, College Research & Interdisciplinary Council, Executive Committee, Graduate Academic Affairs Council, Information Technology Committee, and the Undergraduate Academic Affairs Council. You’ll also find an up-to-date College of Architecture Committee membership list. Along with the committee folder, you’ll find additional folders that will be beneficial to communication such as CARC Policies, Fonts, CARC Logos and Langford Building Plans. Although some of the folders are empty, plans are underway to get information into them. If you have a suggestion as to new folders you feel should be created, please contact Yurii Havey at yurii@tamu.edu or 862-8584 or Kathy Waskom at k-waskom@tamu.edu or 845-1222. Human Resources is offering a new supervisory certificate program! Interpersonal Dimensions of Management provides a unique, tailored training to help supervisors diffuse problem behaviors and lead employees through difficult times while maintaining productivity of the work group and individual employees. The professional staff of the HR Employee Assistance Program (EAP) developed the courses and will teach the classes. Supervisors who have completed a leadership program or have 5 years of supervisory experience are eligible. The certificate program will begin March 2006 so register now for classes. Visit http://hr.tamu.edu/ed/cp/idm for detailed program and registration information. The total cost of the program is $50 and includes a plaque and certificate at the time of completion. For more information, please contact the EAP staff at eap@tamu.edu or 845-3711. Although it is a month away, the VIZ Lab is pleased to announce that PIXAR recruiters will be in the College of Architecture March 22-24. While here, they will visit with VIZ faculty, staff and students and will focus on recruiting. A PIXAR presentation is tentatively scheduled for 7:00 p.m., Thursday, March 23 in the Preston M. Geren Auditorium. Mark your calendars for the annual Viza GOGO production at Rudder Theatre on the Texas A&M University campus at 7:00 p.m., May 5-6, 2006. The annual event exhibits student work from classes in Visualization Sciences. Alumni from the Viz Lab have gone on to work at companies such as ILM, PDI, Pixar, Blue Sky Studios, Disney Microsoft, Rhythm & Hues, and many more.